That’s two, two, two awards in one! Last year, I was thrilled that my story An Autumn Afternoon was runner up at Word of Art, an artist/author collaboration sponsored by In Print Professional Writers.So you can imagine how off the wall I felt on September 4 when one of my stories, Spare Change, won their 2015 author award, selected by Dan Klefsted from the NPR station WNIJ. AndAND (as my friend Rex Hohlbein from the Homeless in Seattle group would put it) the story and art combination alsoALSO (sorry, Rex, for the plagiarism) won the Reader’s Choice award. Homelessness has become a headline. Too often, we read the headline, but fail to see the people. We fail to recognize ourselves in their faces. We fail. I am. These two words are the most powerful in this piece; and that’s why I put them in my painting at least 65 times. Look closely – you may have missed them. I am, in various sizes, bold and standard, forward and backward, upside-down and right-side up. These words are hidden in shadows and blended into the urban sky. Although I didn’t count as I was placing them in the painting, I attempted a rough I am count upon completion, and there were at least 65. Now – The Image. My first instinct was to depict a man. But, as I started sketching, this woman fought to be recognized. That’s when I realized that I’d still had my blinders on. The painful reality is that homelessness can affect anyone, even women, children, and the elderly. So, I needed to reach deeper, until I was able to relate to this spirit. And, that’s when everything fell into place. By the time I was finished, I understood her. She could be me. The Composition. She’s huddled into herself, in a dark corner; surrounded by light and sky – hope – yet unable to reach it and enjoy it. Although a standard portrait will have its subject centered on the canvas, I purposely skewed the format by shoving her into that corner, forcing her into a lower status, and creating an uneasy feeling for the viewer. The Medium. I used a paint thickening medium and a pallet knife, as opposed to a paintbrush, for the majority of this piece. It created divots and sharp edges, fragmenting her surroundings and making her skin look rough from exposure. I was careful not to lose her features – you can tell she was “pretty once” when she WAS someone. 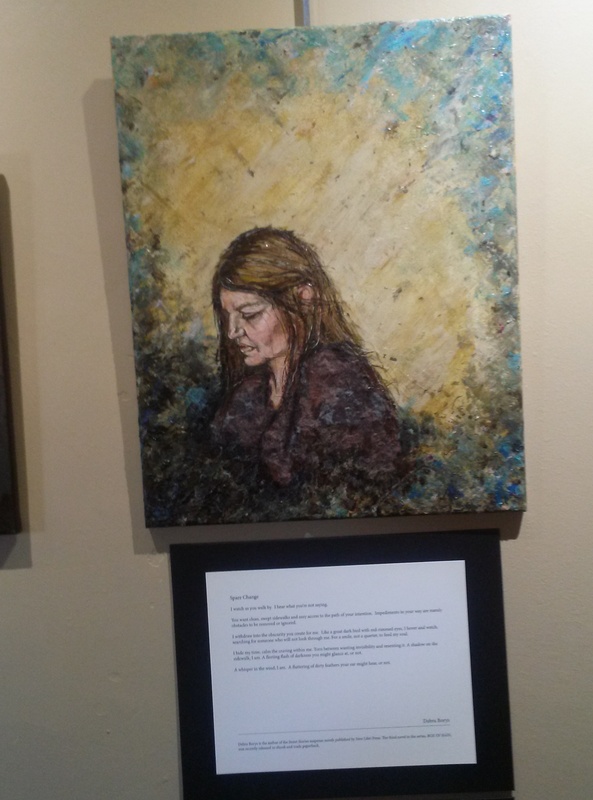 The painting is primarily acrylic, but with some surprise mixed media, to make her more real to me. For survival, she’s been cloaked in a blanket made of my scraps – lint from my dryer – filled with dog hair and debris. She’s literally wrapped in my cast-offs. Mixed in with her painted strands, I’ve included 20-30 real hairs – harvested from my hairbrush. In addition to my own hair, she may have those of my husband and my daughter; to remind me that she could be any one of us. Yes. It is. Feel uncomfortable when you look at her, because that’s honest. But then, get over yourself. See her. She’s real. And she needs you to acknowledge that. What can I add to that? Denise gets it. I hope you get it. I wish everyone could “get it.” because then the world would be a better place. This year, I actually submitted the maximum number of stories (three) to their followup Word of Art 2. It was gratifying that two of my submissions were selected by writers (the maximum allowed per entrant). Both pieces were dear to my heart. Dixie is a poem I wrote after my geriatric miniature poodle passed away, and Spare Change was written about in invisibility of homelessness. Ack! This event is sneaking up on me way too quickly. Still, I’m excited to be going back to Chicago Tribune’s Printers Row Festival. On Sunday, June 7 from 2-6 p.m. I will once again be under the Chicago Writers Association tent from 2 – 6 p.m. selling copies of my Street Stories novels and meeting other book lovers and authors. If you are in the area, I hope you will stop by and say hello. This is going to be a great event with lots of events happening all weekend long. One of these years I am going to go up for the whole weekend so I can enjoy some of the special speakers instead of just standing behind a table full of my books.